Accelerate decision making with reporting tools that deliver customized views of your business overall and focused views of departments and functions. Monitor current financial, operational, and organizational information. Analyze real-time trends related to individual job functions. Create personalized dashboards tied to roles and responsibilities. Display different types of information in a variety of presentation forms including text, charts, graphs, and tables. Acumatica delivers stunning dashboards with large selection of visualizations, pivot tables, and Microsoft Power BI. The management and configuration of dashboards have been significantly enhanced in Acumatica ERP 6, making it far more convenient to add new dashboards, manage existing dashboards, and configure widgets on dashboards, even from mobile devices. Acumatica was the first ERP solution to support embedded Microsoft Power BI components and is now provides a level of self-service BI that truly enables real-time analytics for improved decision making. Provide your sales teams with a complete view of opportunities, contacts and all activities that influence the sales decision. Lead assignment and workflow help manage sales processes to improve efficiency. Deliver a 360 degree view of customer activities and information with full drill-down to everyone in your organization to better serve the customer. Stay up to date with the information that matters using Acumatica BI, powered by cutting-edge Microsoft Power BI. Track your opportunity pipeline, monitor progress, spot trends as they happen, and push your business further. Connect to multiple databases and data services to bring relevant data together in one place. Transform raw data into rich visuals that focus on what matters to you. Manage leads, improve conversions, measure campaign performance, communicate with contacts, and improve productivity. Capture leads from web forms, purchased lists, advertisements, direct mail, events, and other sources. Acumatica Portals enable you to create a customer portal experience where customers can access their information including contracts, financial statements, support cases, and more. 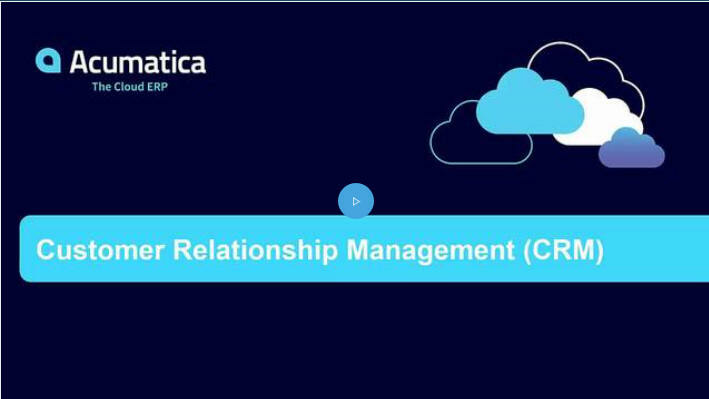 The Acumatica Customer Portal, part of the Customer Management Suite, helps you more efficiently work and communicate with customers. Helpful tools enable customers to see all the relevant information about their interaction and perform account-related activities online. You can also reduce customer support questions by providing anytime access to your knowledge base and document sharing.